In 2001 Ford unveiled their newest addition to their already popular line up of sports utility vehicles. The Ford Escape was unique for its time because of its car-like platform and easy handling. Designed by a team of engineers from Mazda and Ford, the Escape was able to give off a sporty feel that was often missing from other Ford SUVs. 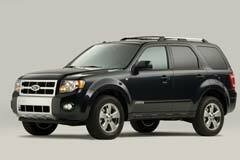 The first generation Escape consisted of a 2.0 liter engine and XLT or XLS trims. Basic features came standard and customers could upgrade to premium seating, a luxury audio system and a powerful V6 engine. In addition, buyers could upgrade the wheels by adding the 16 inch option. The second generation Escape was introduced in 2008 and had very little changes done to the exterior. However, the interior of the vehicle saw a major overhaul. In 2009 a new automatic transmission and 2.3 liter engine was introduced, which was capable of producing 171 hp. The 2010 Escape featured the MyKey system, which was designed to give parents control over the vehicles speed and audio functions. While, the sales of the Ford Escape started out strong, the compact SUV has seen a lull in sales. Customers looking to buy a used Ford Escape may be able to find a vehicle at a decent price due to its low resale value. However, for those buyers looking to get the most for their money, an Escape built in 2008 or after is going to provide the best features and power for their money.